After the Revolutionary War, the citizens of Mecklenburg County worked hard to create a better life in the growing community. By 1786, Charlotte was a community of 276 people (half of whom were African-American), and the surrounding Mecklenburg County boasted 9,000 residents. At this time, Charlotte had a rifle factory, a flour mill, and a sawmill, along with different types of artisans such as tailors, weavers, and blacksmiths. On Christmas night 1794, Sam Polk, Thomas’s nephew, married a woman named Jane Knox, and the couple moved to Mecklenburg County. One year later, on November 2, 1795, the couple’s first child, James Knox Polk, was born into the family. This backcountry boy would rise to become the 11th President of the United States of America. The first of ten children, James Polk was born in a farmhouse (possibly a "log" cabin) in what is now Pineville, North Carolina in Mecklenburg County, just outside of Charlotte. His father, Samuel Polk, was a slaveholder, successful farmer, and surveyor of Scots-Irish descent. The family moved to the Duck River region of Tennessee in 1806. In January 1816, Polk was admitted into the University of North Carolina as a second-semester sophomore. At the time the school was very small with only about 80 students. With the possible encouragement of Andrew Jackson, James K. Polk courted and won the hand of Sarah Childress. They were married in Murfreesboro, Tennessee, on New Year's Day, 1824. Well educated, and staunchly Presbyterian, Sarah was both partner and helpmate through the years of their marriage. Elected to the United States House of Representatives from Tennessee's 6th congressional district. Elected Governor of Tennessee. Polk served only one 2 year term as governor of Tennessee before being defeated for re-election in 1841, and again in 1843. 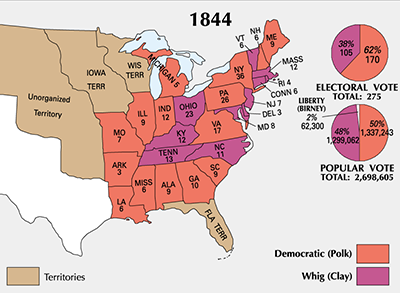 After emerging from the Democratic National Convention as the first "dark horse" candidate in U.S. history (a candidate that seemingly comes out of nowhere at the last minute to secure a nomination), Polk wins the general election in one of the closest Presidential races in history. Even though he lost his home state of Tennessee, he managed to win the popular vote by a slim 40,000 vote margin. In January of 1845 James K. Polk takes office as the youngest President in U.S. history. His 1 term presidency is considered by many as one of the most successful of the so called "forgotten Presidents." As President, Polk was in favor of the immediate annexation of Texas, which became the flash point of the Mexican-American War. The U.S. victory over Mexico, however, led to the addition of the state of Texas, as well as the territories that would become, New Mexico, Arizona, Utah, Nevada, and California. Polk also brokered the deal with Great Britain that added the Oregon territory, which led to the creation of the states of Oregon, Washington, and Idaho. Another of Polk's many achievements was the creation of the Department of the Interior. President Polk was a great believer in Manifest Destiny, the idea that America’s destiny was to stretch from the Atlantic to the Pacific. After James K. Polk was nominated over Martin Van Buren as the Democratic candidate for the 1844 election (partly due to Van Buren’s opposition of the annexation of Texas), he and his running mate George M. Dallas began their Presidential campaign against Whigs Henry Clay and Theodore Frelinghuysen. Polk and Dallas won in most of the South and also took the entire Western border. Clay and Frelinghuysen, on the other hand, swept the Northeastern coast. James K. Polk lost his native state of North Carolina by only about 4,000 popular votes. He also lost Tennessee, his state of residence, by only 123 popular votes. The losses were likely due to the rise in popularity of the Whig Party. Despite these setbacks, however, Polk and Dallas managed to claim victory in the tight race, winning the popular vote by a margin of only 39,000 out of 2.6 million. The Mexican-American War was the first U.S. armed conflict captured by early photography, but few images have survived. This image, called a daguerreotype, shows an American volunteer infantry unit in a street in Saltillo, Mexico. It may depict the First Regiment of North Carolina Foot Volunteers, which was stationed there at the time, along with regiments from Virginia and Mississippi. 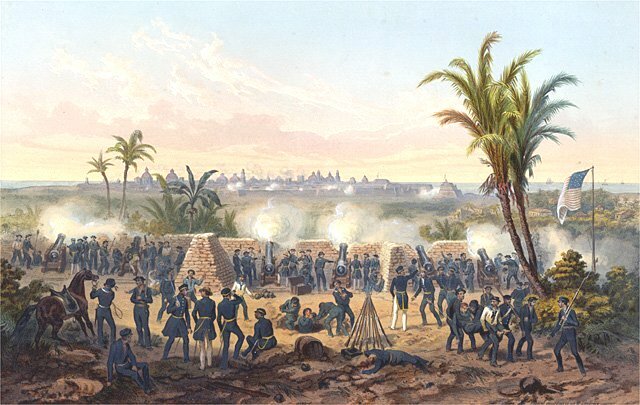 North Carolinians were divided as to their opinions of the war with Mexico; the Democrats supported Polk’s decision to go to war, while the Whigs believed that the Mexican attack was due to the President’s rashness in ordering troops into a disputed area. The state of North Carolina as a whole intended to do what it could to support the war effort until Mexico was defeated. President Polk was authorized to raise 50,000 volunteers, 1,000 of which were to be made up of 10 companies from North Carolina. Such patriotism existed in the state that 32 companies volunteered to fight, and a drawing was held by Governor William A. Graham to determine the 10 that would serve. But when the volunteers learned that they would need to serve for longer than they had agreed to, they backed down. By January, the early enthusiasm had waned significantly. Enlistment was so slow that $10 and 100 acres of western land was offered for every volunteer. Things became even worse when Governor Graham decided that he was to appoint the commanding officers. Bitterness over the unfair appointments of Robert T. Paine and John A. Fagg as colonel and lieutenant colonel led to insubordination by Mecklenburg volunteers, who refused to serve under the two. The volunteers did, however, agree to serve in the regular cavalry, and were soon accepted into the Third United States Dragoons. One of their leaders would be Major William H. Polk, a younger brother of the President. In the course of the war, the Third Dragoons would suffer 150 casualties, including 54 deserters, and the North Carolina volunteer division would have one of the highest mortality rates of the war.